Mass Effect: Andromeda - the first Mass Effect game to not have Commander Shepard as a protagonist! Okay, technically that isn't true, apparently there were a couple of mobile games, even one featuring Jacob and Miranda in it – however, I'm talking about PC games here and Mass Effect: Andromeda is the fourth instalment. As the name implies, Mass Effect: Andromeda is not set in our Milky Way galaxy and you'll find yourself exploring a part of the Andromeda Galaxy known as the Heleus Cluster. You play the role of a Human "Pathfinder" called Ryder, who is the man (or woman) in charge of exploring new worlds for your ark of 20,000 Human colonists. It's not only Humans that have sent colony ships though; Turians, Salarians and Asari also have arks and there's even a space station similar to the Citadel called the Nexus. However, the Heleus Cluster is a dangerous place filled with hostile worlds and hostile aliens. It's your job to explore new worlds, eliminate hostile aliens, ally with friendly ones, mark suitable sites for outposts and ultimately create a home for the Andromeda Initiative. For those who are Mass Effect veterans you're probably wondering how does the gameplay actually differ from the original trilogy. Well, it's still technically an action RPG but with a greater focus on action than RPG: there are no classes like you had in the original trilogy and you can basically tailor Ryder's stats to whatever you choose; also gone are the micromanaging of party member skills as combat is now totally in real-time and the only orders you can give is to hold a position or not. 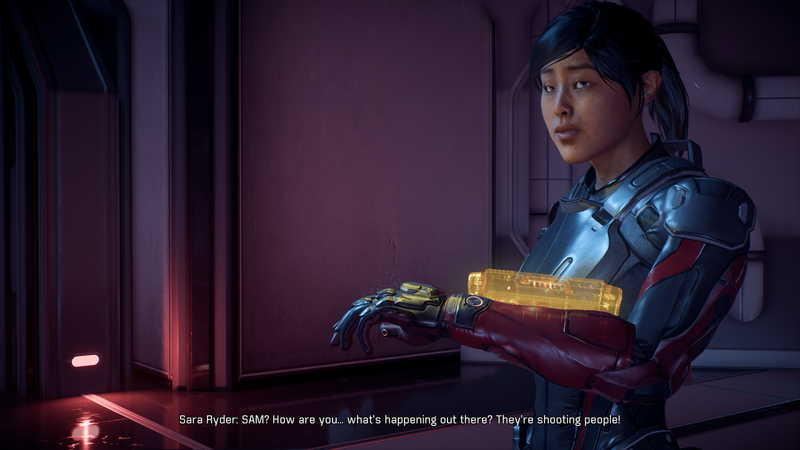 Finally, there is no Paragon/Renegade system in Mass Effect: Andromeda - instead you pick a conversational tone (i.e. emotional, logical, professional or casual) similar to what was implemented in Dragon Age 2. 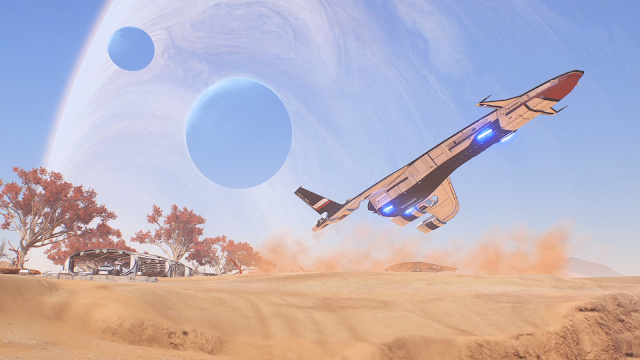 Exploration of the Heleus Cluster is done in a similar way to the original trilogy as you point and click to various star systems and planets to visit and exploring these locations will give you resources similar to the first Mass Effect. In fact, another way the game is similar to the original Mass Effect is that you can explore planets using a rover called the Nomad (it's not as good at scaling ridiculously steep inclines like the Mako though). Crafting is something new to the Mass Effect trilogy in that you have to acquire resources from around the sector to actually craft and customise your gear – never has there been as much customisation options in the series prior to the release of this game. As you all know, I'm a big fan of the Mass Effect series having played every game in the original trilogy (multiple times), having read the books by Drew Karpyshyn and even watching the anime with James Vega in it called "Mass Effect: Paragon Lost". So after waiting 5 years for another Mass Effect game, I finally got one for my birthday thanks to my darling wife (you're the best). Sure, there is no Commander Shepard, no Citadel, no Human Systems Alliance, no Milky Way Galaxy, etc., etc. but it's still Mass Effect right? While the original trilogy delved a little bit into your family background, it was never a pivotal part of the plot like it is in Mass Effect: Andromeda. In this game, you travel with your entire family to the Heleus Cluster and not only that, but you're even able to customise your twin's appearance! Also, your father's appearance is based on how you customise your character so it looks like Bioware took a page out of Fallout 3's book. The game has a lot of side quests and many are not really worth the time you invest in them, but there are a few that really stand out and are genuinely hilarious. Favourites of mine include setting up a movie night for your crew (it takes a long time to prepare but I reckon it's worth it) and Liam's loyalty quest which almost feels like a buddy cop film or B-grade action flick (which works on another level considering Liam's favourite pastime). The game no longer has Paragon and Renegade points, conversation options or interrupts. Instead you get different conversation tones (as mentioned before) and there are some limited opportunities for interrupts as well, but they're no longer categorised as a Paragon or Renegade interrupt. Overall, I think this was a good idea since a lot of people ended up not really roleplaying since you'd want to maximise Paragon or Renegade points in order to unlock powerful conversation choices that could make you avoid conflict or loss of life altogether. In this game, since there's apparently no real benefit from sticking with one particular conversation style, you can be free to just act like yourself without fearing you're weakening your character as a result (at least as far as I'm aware). I'm not going to provide any spoilers on how much of the original series is referenced but it's bound to happen to at least a superficial degree considering it's set in the same universe. You'll learn about old rivalries, old organisations from the Milky Way, and even meet some relatives of certain characters you may or may not remember from the original trilogy. 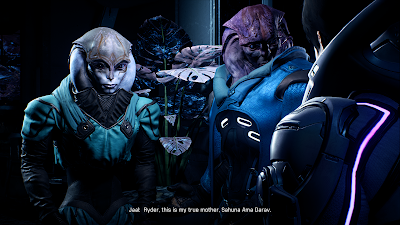 I'm a big sucker for an epilogue done right and considering some games don't even include an epilogue nowadays, it's great to see that Mass Effect: Andromeda has put some effort into its ending. There aren't many planets that you can actually land on in this game but Bioware have taken a lot of effort into making these beautiful worlds come to life. It actually took me a while to get into the soundtrack because it's not as noticeable as the soundtracks from the original trilogy, probably because there is no background music for many segments in the game. However, it grew on me and I can appreciate it as being one of the strengths of this game. John Paesano does an epic job in his debut role as a video game composer (he's got plenty of experience as a film and TV composer under his belt) and even managed to tap into the original trilogy feel with tracks like "A Trail of Hope" and "Heleus". Combat is much more intense now especially considering you can't pause combat anymore and it definitely feels more like an outright third-person shooter instead of an RPG. It's definitely satisfying when you manage to take out an entire enemy camp with a sniper rifle without any of them even noticing! Remember those talks in the elevator between your party members in the original Mass Effect? Well they're back in Mass Effect: Andromeda except they don't occur in the elevator but in the Nomad instead. I really loved this aspect of Mass Effect 1 (and a lot of Bioware RPGs in general) so it's good to see it make a return. You no longer get Paragon or Renegade interrupts but you do get hug interrupts. No joke. Are there any benefits or drawbacks to the conversation tone? On one hand, yeah, I appreciate the fact that you're not trying to maximise your chances to have a super Paragon or Renegade conversation option ace up your sleeve further down the track, but it'd be nice if characters actually reacted differently to you as a result of your established personality. Apparently this is meant to occur according to this PC Gamer interview but if it does occur, I definitely didn't notice it in my playthrough – perhaps it's really subtle I guess? Maybe they should've done what Telltale Games does in their adventures and have some text saying "Whatshisface will remember this" after picking a particular conversation choice? Some of the scriptwriting seems pretty poor as sometimes characters strike off on random tangents for no reason whatsoever. I especially found it difficult following conversations with Liam or Colonial Director Addison since they'd be cutting straight to certain topics without any introduction or context as to what you're meant to be talking about: it makes it difficult to respond with a well thought-out response when you don't even know what you're talking about in the first place! Despite the game receiving several updates to fix graphical glitches (especially the infamous facial animations) the game still has its fair share such as the time I was talking to Jaal in the Cultural Centre and Ryder turned his head 180 degrees like a scene out of "The Exorcist" or when NPCs in the background magically teleported in and out of the scene. I don't know why this seems to happen in games using the most recent Frostbite engine but despite having a really fluid experience during combat and exploration, the framerate drops considerably whenever it zooms in for a conversation or during cutscenes. It's a thing that really annoyed me about Dragon Age: Inquisition and Battlefield 1 that it actually prompted me to buy a new computer to see if things would improve – unfortunately it has not. So, if anyone else is experiencing these issues, I think it's a case of just living with it. This is related to poor facial animations I mentioned earlier but the lip-synching gets pretty bad during conversations too. The release version of the game also had wooden acting; i.e. the characters didn't sway, gesticulate or do anything you'd expect a living, breathing human to do but this was thankfully fixed in recent patches. As mentioned earlier, there are no classes in this game which I miss – what's the point of playing an RPG if you can't pick a class? Ryder basically becomes a jack-of-all-trades that can do almost anything. I preferred the way the original trilogy handled classes and how they all had a special ability that differentiated one from the other. The game is just way too long. It took me 58 hours to do a single playthrough and I didn't even finish all the sidequests in the game (I only focused on the main storyline and loyalty missions); I probably could've finished the whole original trilogy in that time! There's so much needless grinding, flying back and forth from planets, fetch quests, "dailies" (in the form of APEX missions), mining, researching, crafting, etc. that gets in the way of the core experience. To me, it really hampers the replay value of the game since are you willing to go through the whole rigmarole again just to experience a slightly different outcome? It takes a long time to perform certain quests because you have to travel between several planets to complete them. This wouldn't normally be too much of a problem if it weren't for the fact you can't skip planetary arrival and departure cutscenes! I've probably wasted an hour total watching those cutscenes thanks to not having a choice to skip them. In the release version of the game, not only did you have to wait patiently while you arrived at a planet or departed it, but you also had to wait to travel between planets inside a star system! Argh! Thankfully, this was eventually patched and you can at least skip this sequence from now on. Okay, maybe I'm having a dummy spit but the romance system in Mass Effect: Andromeda was revamped and I ended up without a romantic relationship with any of my crewmates; that's because in Mass Effect: Andromeda you have to hit on your crewmates from the get-go. No learning more about your crewmates before you decide whether they're relationship material or not. As soon as you meet Cora on the Tempest it's full steam ahead with the "Hey baby, what's your sign?" – otherwise, you're out. This is dissimilar to the original trilogy where all you needed to do was act nice to your crewmates and the potential for a relationship presented itself. To some degree, the new romance system is probably more realistic since I ended up with nobody (in reality I'm probably quite cautious and slow to initiate a romantic relationship) but on the other hand, it seems the only way to have a successful relationship in Mass Effect: Andromeda is to make sure you're a Lothario (or whatever the female equivalent of that is, if you're Sara Ryder) and apparently everybody loves that… really? For a long time I was thinking of giving Mass Effect: Andromeda a 7/10: the game is basically Dragon Age: Inquisition in SPAAAAACE and it doesn't shy away from the fact it's a spin-off of the original trilogy; To me, Mass Effect: Andromeda is basically to the original Mass Effect trilogy what "Deep Space Nine" is to "The Next Generation". "Star Trek" fans took a long time to warm to the new direction taken with "Deep Space Nine" and some never ended up liking it and I think the same rings true with Mass Effect: Andromeda. It took me a long time to appreciate Mass Effect: Andromeda for what it is but provided you're not deterred by the glitches, performance issues and the change in gameplay to a more open world RPG, it can actually be fun – sometimes a lot of fun. Is the game worth $89.99 AUD? : No. Maybe if you managed to get the game for under $50 AUD it'd be worth the money (like it is now, where it's 50% off on Origin). Despite many of the major bugs and flaws being fixed now, the game still has issues. However, there is a lot of gameplay here and for those wanting a game they can invest 100 hours into, ME:A shouldn't disappoint.